Few concepts in modern IT are as widely covered today as the Internet of Things (IoT), and for good reason. The IoT is right at the intersection of wireless connectivity, nontraditional computing devices, cloud computing infrastructure and integrated supply chain management (SCM), i.e., all of the most significant developments in enterprise IT strategy over the last few decades. As a term, “IoT” was coined during a 1999 presentation about the combination of radio frequency identification (RFID) with internet connectivity in supply chains. From the very beginning, the IoT was closely associated with SCM, with vendors seeking ways to harness the vast, distributed intelligence of IoT devices such as sensors and RFID trackers to monitor key assets. Almost 20 years later, does the modern IoT resemble this pioneering vision of an expansive IP-enabled architecture? Sort of. Numerous IoT products and services have come to market since that time, from smart thermostats and security cameras to enhanced business workflow automation. However, a 2017 Cisco survey found that only 26 percent of all companies felt successful with their IoT initiatives. Let’s explore why there is such widespread dissatisfaction and how it might be remedied. The IoT is inherently complex, due to its massive size along with the many particular issues that can surface during the deployment, maintenance and upgrading of its individual devices. For example, security incidents that can be quickly patched on a PC or smartphone, such as the KRACK Wi-Fi exploit, might take much longer to be fixed, if at all, on IoT endpoints with more limited interfaces. Due to such complications, many IoT projects eventually go over budget and fall behind schedule. The energy IoT, in which solar panels are integrated with electrical grids, perfectly demonstrates what often goes wrong: As additional electricity-generating assets are added to the network, securing and tracking each and every one of them becomes progressively more difficult, ultimately overwhelming IT teams. Similar issues affect IoT efforts across other verticals, too, with insufficient solution planning a major cause of the unsatisfactory results. Fixating on specific protocols: Protocols are a dime a dozen in the IoT, from new cellular technologies like NarrowBand IoT to specialized standards such as ZigBee. While the differences are important, it’s usually better to focus on use cases before getting tangled up in protocol minutiae. Viewing IoT as cloud redux: Cloud computing and the IoT have a lot in common, beginning with their enormous scale and considerable variety in endpoints. At the same time, the IoT offers unique opportunities for further business workflow automation, as well as unique user interaction models. Taking a DIY approach: Just as many organizations struggle to maintain a complex private cloud on their own (and hence opt for vendor help or resort to public cloud), going it alone with IoT is more often than not a bad idea, mostly due to the rapidly evolving technologies involved. So what is the ticket to IoT success? The answer is to work backward from the desired business outcome and settle on actual technologies only after you have a clear sense of what they will be used for. The mishaps we highlighted above all stem from doing the opposite; it’s the technological equivalent of trying to prepare a complicated meal for the first time without using a recipe. A digital twin is a computerized companion to a physical asset. Think of it this way: A lot of digitization turns real-world objects like ledgers or photo collections into immaterial equivalents, i.e. 1’s and 0’s on a machine. With digital twins, the physical original continues to exist and is accompanied by a digital counterpart. Examples could include embedded cloud-connected sensors that monitor a system for repair, or wearables that provide indicators as to where certain items are located in a warehouse. With these digital twins, it’s possible to capture real-time data about production lines, make accurate predictions about production times and dramatically reduce time spent on guesswork and estimations. In other words, they pave the road to more streamlined and integrated SCM. IoT’s roots in RFID live on in automated material movement with in-plant traceability. 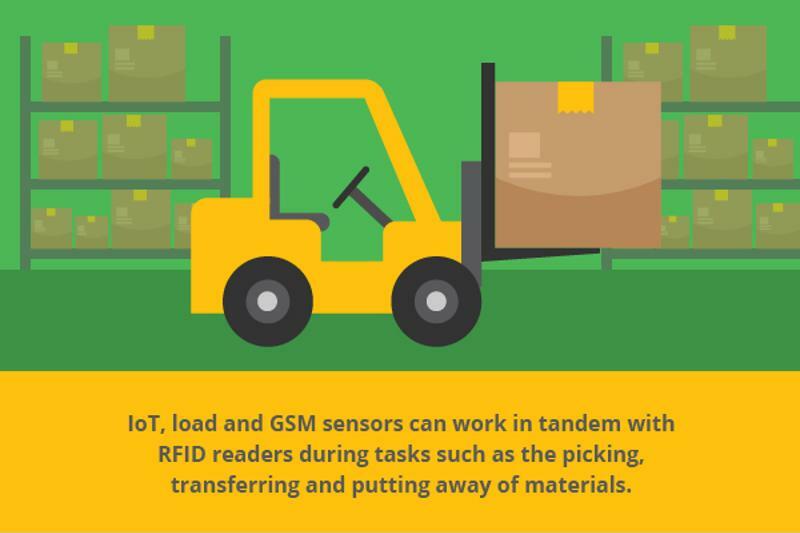 IoT, load and GSM sensors can work in tandem with RFID readers during tasks such as the picking, transferring and putting away of materials. Metrics such as position, weight and SKU call all be closely monitored throughout an object’s entire journey through the plant. The upshot is reliable, automated validation, not to mention easy exception management and convenient tracking of in-transit assets via a dashboard. Like digital twins, workflow automation ensures fewer surprises and delays since supply chain is so much more dependable. How do these IoTs innovations affect the bottom line? The differences speak for themselves: Data entry items can be reduced by up to 75 percent, according to Assembly Mag, while labor costs can fall by 20 to 30 percent, according to a Deloitte and MHI study. The potential of the IoT is virtually unlimited, but it’s also not inevitable. Scalable processes and tools, especially within the supply chain, are essential for capitalizing on IoT’s promise. As integrated supply chain experts, the team at Inspirage can help you develop holistic solutions enhanced by our deep expertise in both IoT technologies and consulting services. Learn more by visiting our resource center or contacting us directly.